Ocean water is currently an average of 3.5% (by weight) percent dry matter. Dry ocean salt is composed of 80 elements - minerals. Natural Salt is an essential element in the diet of not only humans but of animals, and even of many plants. Use of natural salt is as old as human history. 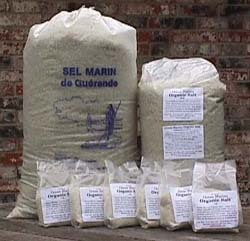 Natural Salt is one of the most effective and most widely used of all food seasonings and natural preservatives. Natural salt is a source of 21 essential and 30 accessory minerals that are essential to our health. According to some sources, other elements are up to 5% of dry ocean salt. Refined salt contain only 0.1 - 0.5% other elements. 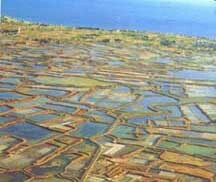 The salt flats of Guérande, one of France's National Treasures. >Unrefined sea salt contain 98.0 % NaCl (sodium-chloride) and up to 2.0% other minerals (salts) : Epsom salts and other Magnesium salts, Calcium salts, Potassium (Kalium) salts, Manganese salts, Phosphorus >salts, Iodine salts, .. all together over 100 minerals composed of 80 chemical elements... Composition of crystal of ocean salt is so complicated that no laboratory in the world can produce it from its basic 80 chemical elements. Nature is still better chemist than people. >Refined salt (Table Salt) is 99.9% NaCl (sodium-chloride), (chemical as clean as Heroin or White Sugar) . It almost always contain additives, like 0.01% of Potassium-Iodide (added to the salt to avoid Iodine deficiency disease of thyroid gland), Sugar (added to stabilize Iodine and as anti-caking chemical), Aluminum silicate. >Refined (table) salt is used last 50-100 years (depend of the country). These elements are extracted and sold separately to industry. Precious and highly prized by the salt refiners, these bring more profits than the salt itself. further adulterated by chemical additives to make it free- flowing, bleached, and iodized. In addition, harmful chemicals have been added to the processed, altered unnatural substance to mask and cover up all of the impurities it has. These added chemicals include free flowing agents, inorganic iodine, plus dextrose and bleaching agents. Standard salt additives: >Potassium-Iodide (added to the salt to avoid Iodine deficiency disease of thyroid gland), Sugar (added to stabilize Iodine and as anti-caking chemical), Aluminum silicate. >Use of salt is as old as human history. Oldest records come from China. Some 2,700 years B.C.-about 4,700 years ago-there was published in China the PENG-TZAO-KAN-MU. A major portion of this writing discussing of more than 40 kinds of salt, including descriptions of two methods of extracting salt and putting it in usable form that are amazingly similar to processes used today. >The ocean is allowed to flood huge, flat, shallow, beds and then the dam is closed to trap the water. The water is then naturally evaporated by the sun & this leaves a layer of sea salt. Dirty brown salt is on the bottom and pretty white salt at the top. >Since most people are used to white salt, they just skim off the top white salt & call it "sea salt". UNFORTUNATELY, the trace minerals are mostly in the brown stuff at the bottom. Real Ocean Sea Salt is produced from unseparated salt. That is why it is slightly darker. 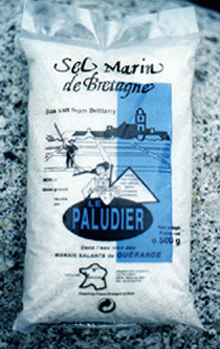 >Celtic Salt, Muramoto Salt and Lima Salt contain also darker salt. >When producing table salt, other mineral salts are used for chemical industry, or are washed back into the sea, or are used for animals. If we humans just could eat as good as animals!? > Natural salt is not white and it is not dry. It is a little gray with minerals and feels damp or clumps in humidity. Mineral salt is mined from thousands of feet below the ground surface in areas where there is a layer of mineral salts. > Mineral salt can also be harvested by pumping water deep underground in areas where layer of salt is discovered. 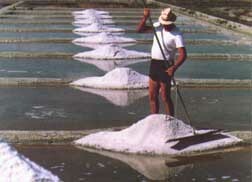 Salty water that comes out, is then used in salt production. Process is called vacuum pan salt refining. > There are two theories. One says that mineral salt is layer of salt created after evaporation of old seas. According to other theory, layer of mineral salt was created by chemical reaction. > Mineral salt is often in crystal form. It is transparent crystal, or light tan in color with little darker flecks. But, it can also be of many different colors. Not all mineral salts are rich in trace elements. Some are similar to ocean salt, other are not. >If you ask me, I prefer Ocean salt. >Salt is a vital substance for the survival of all living creatures, particularly humans. Water and salt regulate the water content of the body. Water itself regulates the water content of the interior of the cell by working its way into all of the cells it reaches. It has to get there to cleanse and extract the toxic wastes of cell metabolisms. Salt forces some water to stay outside the cells. It balances the amount of water that stays outside the cells. There are two oceans of water in the body; one ocean is held inside the cells of the body, and the other ocean is held outside the cells. Good health depends on a most delicate balance between the volume of these oceans, and this balance is achieved by salt - unrefined salt. The following information is from "Seasalt’s Hidden Powers" . You should get your hands on this book and the entire family should be educated on the facts of life. The late French scientist Dr. Alexis Carrel kept a chicken heart alive for over 27 years by having the pulsating heart IN A SOLUTION OF SEA SALT, i.e. isotonic seawater. Dr. Carrel voluntarily ended the experiment after a third of a century, having proven that living cells can have physical immortality. Professor C. Louis Kervran with his scientific research and formulas has been an asset to the scientific establishment and he was a candidate for the Noble Prize. Professor Kervran links us to the secret of immortality and reveals its prime source is trace minerals from seawater [and used in] remedies. Other physicians continued research and found fermentations of briny salt pickles, salted sour plums, and other salty fermentations to be powerful and effective medicines. Dr. Jacques de Langre, Ph.D., who wrote the book "Seasalt’s Hidden Powers", states that naturally and properly sunshine-preserved sea salt is the difference between life and death, health and illness, social sanity and planetary panic and its elements are vital for proper body functions. That natural hand-harvested Celtic ocean salt alone helps to maintain life, neutralizes toxins and detrimental bacteria, and enhances all our organic function. Natural sea salt [reconstituted seawater] allows liquids to freely cross body membranes, the kidney’s glomerulus's and blood vessels walls. Whenever the sodium chloride concentration rises in the blood, the water in the neighboring tissues is attracted to that salt-rich blood, and the cells then re-absorb the enriched intra-cellular fluid. If they are functioning properly, the kidneys remove the saline fluids easily. Refined salt does not allow this free-crossing of liquids and minerals, and causes accumulated fluids to stagnate in joint, producing edema and chronic kidney problems. In ancient Celts times, salt was used to treat major physical and mental disturbances, severe burns, and other ailments. Today biologists attest that seawater (also called 'mother liquor') restores hydro-electrolytic imbalances, a disorder that causes loss of immune response, creates allergies, and causes many health problems. Also the therapeutic effect of seawater is recognized and used by the best European medical professionals because of its effectiveness in so many situations. Today people fear salt and we are witnessing a virtual ban on consuming products with high sodium contents and this is a major concern of biologists. The use of real sea salt-free diets are showing up in the reality of our modern world as society is coming apart. It is basically a starvation of macro- and trace minerals and biological deficiencies cannot be corrected by refined sodium chloride alone. Celtic salt is a good product because it is naturally extracted by the use of sunshine. If one would re-dissolve salt in water in the proper ratio or combine it in the moisture of foods, its properties re-create the amazing powers of the "ocean" and bears an astonishing likeness to human blood and body fluids. During World War II, Navy doctors would use sea salt water for blood transfusions when blood supplies ran out and many lives were saved. Dr. Langre mentions in his book that, "The Belgian historian Henri Pirenne observed that during the High Middle ages, the entire coast of the Atlantic was deserted and the entire continent was thrown into a Dark Age of human under-development. 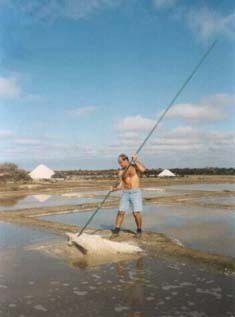 Historians tell us that it was caused to a great extent by the lack of salt in the human diet, the flooding of all salt flats having disabled every salt farm along the coastlines of the Atlantic Ocean and the Mediterranean Sea. The whole of Europe, therefore, suffered from a salt famine that was to last almost 500 years. The daily average ration fell to less than 2 grams per person and caused may to die from dehydration and madness. The extent of the salt famine reported by Henri Pirenne caused human flesh to be sold on the open-air markets and created an epidemic of crazed people who, to replenish their salt, drank blood from the neck artery of the person they had just slain. Quick to exploit this desperate situation for their own gain, the rulers of Europe grabbed the remnants of the salt stock and exacted exorbitant salt taxes. Heavily burdened by tariffs and gabelles, common salt became a luxury but also caused mass population shifts and exodus, lured invaders and caused wars. Mined salt from the depths of the earth was substituted, but the lack of live and balanced trace elements in rock salt lowered the mental equilibrium and intellect level almost as much as the sheer absence of salt." 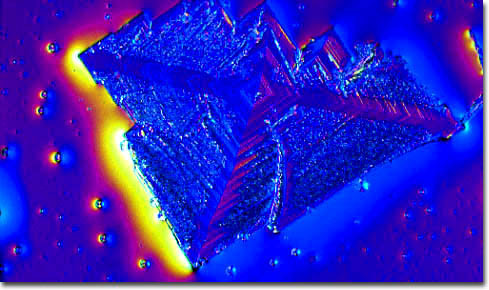 Dr. Langre, Ph.D. writes that, "Rare gases are locked within real sea crystals and began to release in contact of additional moisture and is effective in maintaining and restoring human energy. Note that Celtic salt should not be ground until used because as it is milled the salt releases a subtle fragrance reminiscent of violets, another telltale sign that gases, floral-like vital essences, are being released. Note that these elements are easily trapped and stored in a preparation called sesame salt and a recipe is given in the Seasalt’s Hidden Powers. Real sea salt needs to be stored in an air tight container and kept in a dark cool place. The moisture has a tendency to settle to the bottom of the salt and the salt should be mixed before removing the salt for sure. Real sea salt need to penetrate foods allowing the moisture of the fruits, vegetables, grains, etc. to liquefy the salt which activates it. If dry salt is used it enters the body in a non-ionized form and can creates thirst (a sign of being poisoned) and lessens its abilities because it is not being assimilated and utilized properly. Sea water losses its properties of destroying bacilli if stored in bottles and when dries out. A pinch of salt can be added to a small amount of water to dissolve to activate its powers and added to fruits, vegetables, grains to aid in better digestion of those items while helping to alkalize the body. Adding a pinch to water supplies adds alkaline properties and the mineral content. The minerals it contains are too valuable to ignore. >People who eat Refined salt develop craving for salt, because, salt that they eat is not satisfying their needs. Than they use more and more salt, in the desperate try to get what they need. Taking big amounts of refined salt (chemical) burden kidneys and adrenal glands that are very important for calcium utilization. Modern physiology has demonstrated that an excess of salt interferes with the absorption of nutrients and depletes calcium, while if used in a moderate doses, salt enhances calcium absorption and nutrient utilization in general. >It is known that absorption of calcium depends on the health of the kidney-adrenal function and that calcium metabolism is of essential importance for the health of the nerves, muscles, heart, vascular system, and bones. Simply. the whole body is dependant on Calcium uptake. London, March 12 - A low-salt diet may not be so healthy after all. Defying a generation of health advice, a controversial new study concludes that the less salt people eat, the higher their risk of untimely death. The study, led by Dr. Michael Alderman, chairman of epidemiology at Albert Einstein School; of Medicine in New York and president of the American Society of Hypertension, suggests the government should consider suspending it's recommendation that people restrict the amount of salt they eat. Natural salt is not white and it is not dry. It is a little gray with minerals and feels damp or clumps in humidity. It must be labeled UNREFINED, NO ADDITIVES ADDED. Hawaiian Specialty Salt Company, Inc. The best salt varieties and flavors that Hawaii has to offer. We now offer over 10 different types of salt for any occasion. SaltWorks, America's Sea Salt Company, offers premium gourmet sea salts and bath salts. From Fleur De Sel and Bokek Dead Sea salt to Salish smoked salt and EuroSpa bath salts, our products are the highest quality, suitable for both home and professional use. Buy online in retail or wholesale quantities. At greysalt.com you will find the finest natural and organic products: organic and natural gray sea salts, organic first cold-pressed oils, natural and organic recipes, and lots of useful natural and organic health information. FACT - The salinity of the water outside the cells in our bodies is similar to the ocean. >Sodium chloride or what is today called table salt (common salt) is the chemical compound NaCl. Chemically, it is 60.663% elemental chlorine (Cl) and 39.337% sodium (Na). > Most recent analysis demonstrated that Celtic Sea Salt® contained at least 75 minerals and trace elements. The following lists the most predominant elements revealed by this analysis. This is a partial analysis, if you are interested in the full analysis please call. Light Grey Celtic Sea Salt® contains 33% Sodium, 50.9% Chloride, 1.8% Minerals and Trace Elements and 14.3% moisture. Potassium exists primarily in intracellular fluids (the fluid inside cells). Potassium stimulates nerve impulses and muscle contractions and is important for the maintenance of osmotic pressure. Potassium regulates the body’s acid-alkali balance, stimulates kidney and adrenal functioning, and assists in converting glucose to glycogen. Also, potassium is important for biosynthesis of protein. Small amounts of tin appear to be necessary for normal growth. Because tin is common in soil, foods, and water, deficiencies are rare. Because of poor absorption, low tissue accumulation and rapid tissue turnover, tin has a low level of toxicity. Book that you should read! >Sodium chloride is the chemical compound NaCl. Chemically, it is 60.663% elemental chlorine (Cl) and 39.337% sodium (Na).